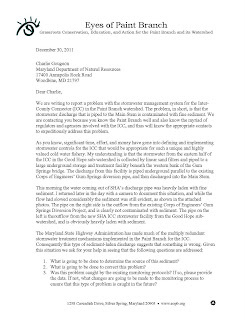 We are writing to report a problem with the stormwater management system for the Inter-County Connector (ICC) in the Paint Branch watershed. 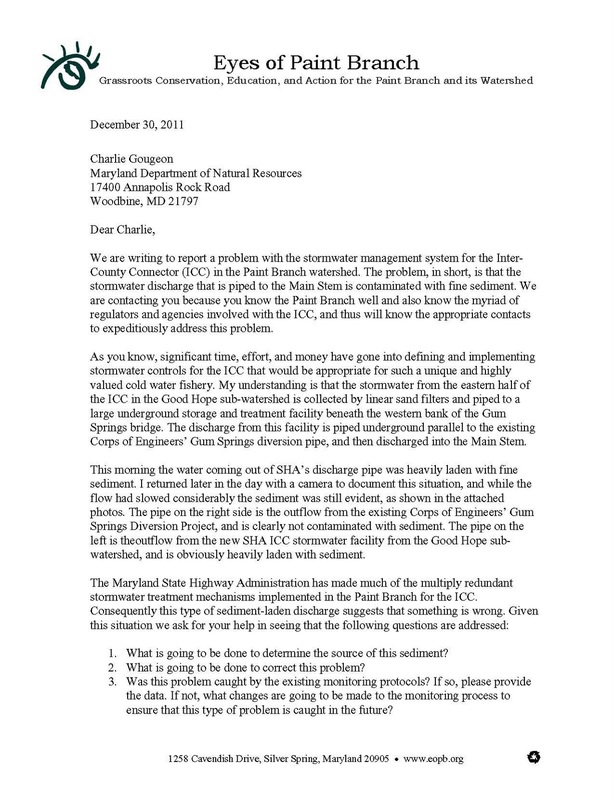 The problem, in short, is that the stormwater discharge that is piped to the Main Stem is contaminated with fine sediment. 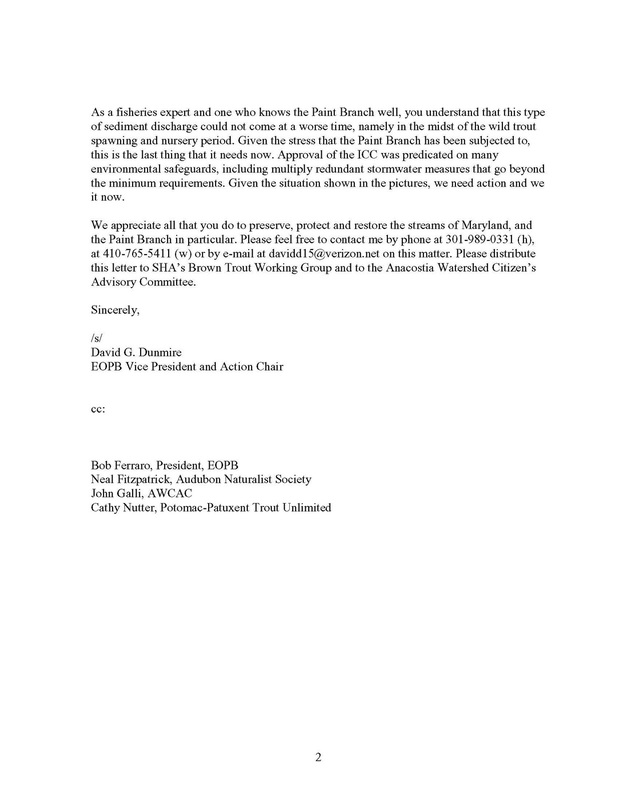 We are contacting you because you know the Paint Branch well and also know the myriad of regulators and agencies involved with the ICC, and thus will know the appropriate contacts to expeditiously address this problem. 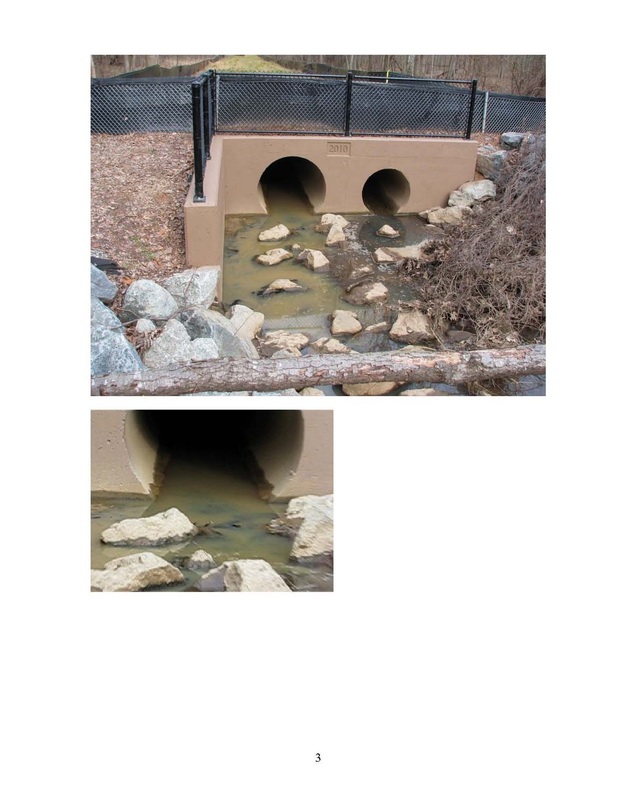 As you know, significant time, effort, and money have gone into defining and implementing stormwater controls for the ICC that would be appropriate for such a unique and highly valued cold water fishery. My understanding is that the stormwater from the eastern half of the ICC in the Good Hope sub-watershed is collected by linear sand filters and piped to a large underground storage and treatment facility beneath the western bank of the Gum Springs bridge. The discharge from this facility is piped underground parallel to the existing Corps of Engineers’ Gum Springs diversion pipe, and then discharged into the Main Stem. This morning the water coming out of SHA’s discharge pipe was heavily laden with fine sediment. I returned later in the day with a camera to document this situation, and while the flow had slowed considerably the sediment was still evident, as shown in the attached photos. The pipe on the right side is the outflow from the existing Corps of Engineers’ Gum Springs Diversion Project, and is clearly not contaminated with sediment. The pipe on the left is theoutflow from the new SHA ICC stormwater facility from the Good Hope sub-watershed, and is obviously heavily laden with sediment. What is going to be done to determine the source of this sediment? What is going to be done to correct this problem? Was this problem caught by the existing monitoring protocols? If so, please provide the data. If not, what changes are going to be made to the monitoring process to ensure that this type of problem is caught in the future? As a fisheries expert and one who knows the Paint Branch well, you understand that this type of sediment discharge could not come at a worse time, namely in the midst of the wild trout spawning and nursery period. 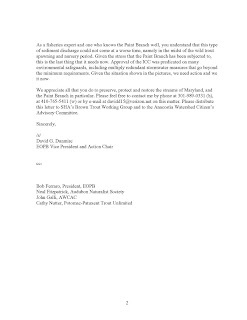 Given the stress that the Paint Branch has been subjected to, this is the last thing that it needs now. Approval of the ICC was predicated on many environmental safeguards, including multiply redundant stormwater measures that go beyond the minimum requirements. Given the situation shown in the pictures, we need action and we it now. We appreciate all that you do to preserve, protect and restore the streams of Maryland, and the Paint Branch in particular.